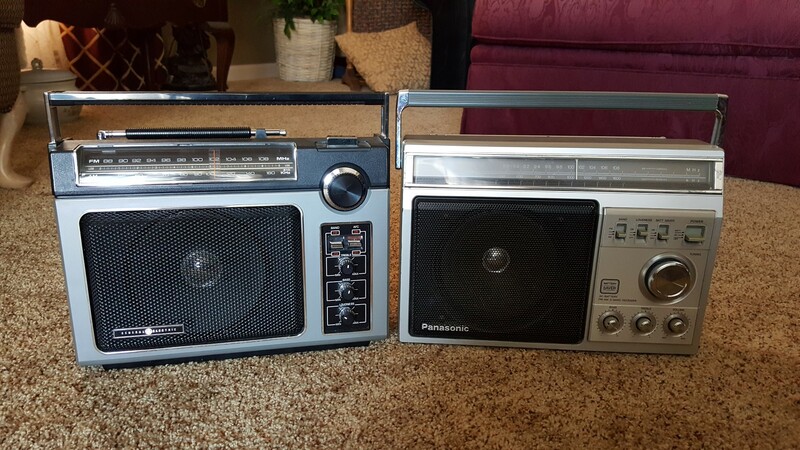 One of the nicer recent additions to my collection is the Panasonic RF-1401. Common internet wisdom has it that the ‘1401 was “Panasonic’s answer to the GE Superadios”. There is some truth in this…the RF-1401 does compete with the GE SR and SR II in design concept and approximate dates of manufacture but as we will see they are rather differently designed internally giving each areas of superiority over the other. It therefore depends somewhat on your personal preferences and the nature of signals in your listening area which you might like better. 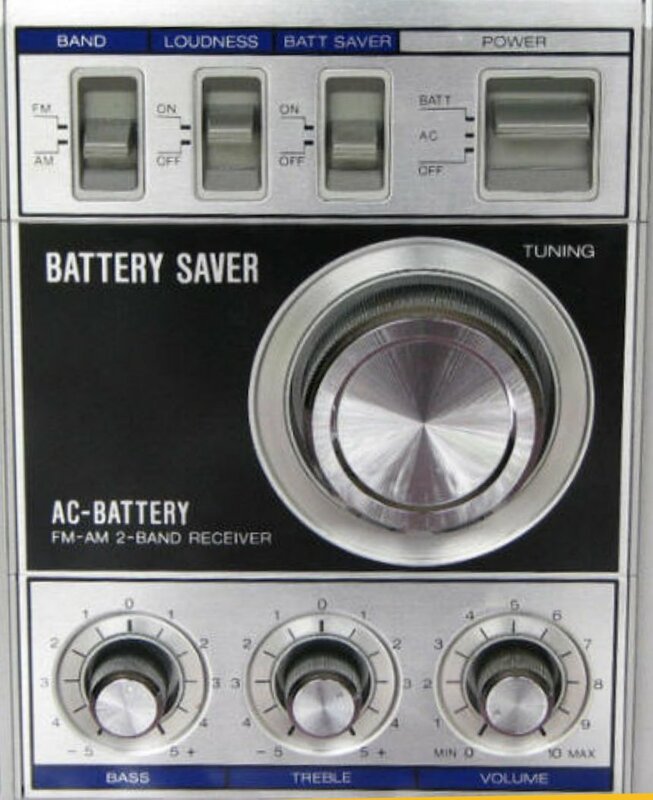 The biggest difference in circuitry is that the first GE SR was designed in the late 1970’s, when better radios were still being made with mechanical, air variable three gang tuning condensers and a tuned RF stage which, when properly executed can yield excellent sensitivity while minimizing overload and interference from unwanted signals. 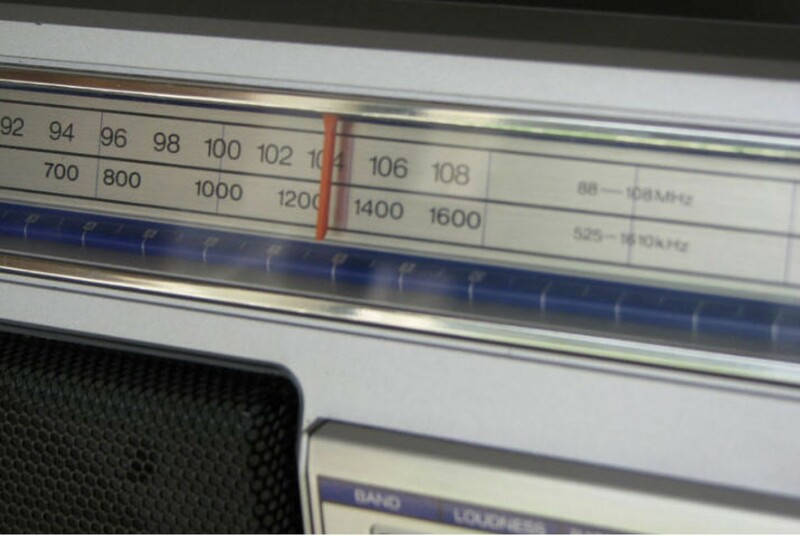 Although the SR II was still being made years later this original design was not changed, but later radios like the RF-1401 (probably introduced around 1983) took advantage of newer technologies which reduced cost and complexity with small sacrifices in performance; chief among them the use of a ceramic vari-cap tuning system. You can still get almost as good performance out of this kind of tuner as long as everything else is carefully designed and manufactured and I will say that the RF-1401 exemplifies that philosophy which is why it can still perform as well as it does even though it is at a theoretical disadvantage. The RF-1401 is a full-sized nicely-styled portable with a long, clear slide rule dial. The only additional controls beyond the basic ones are a loudness switch which boosts bass and treble at lower volumes and a battery saver switch…a feature which was somewhat popular in that era. It reduces audio output power when maximum audio is not needed…this significantly extends battery life by 30 – 50% depending on volume level with a slight but noticeable reduction in performance. However with today’s modern batteries this feature is much less needed. You can expect somewhere in the neighborhood of 200 – 300 hours of play time under average conditions with alkaline cells but that can be extended significantly if you choose to use the battery saver feature. As for the loudness switch, many portable radios (such as the GE Superadios) incorporate a non-defeatable loudness circuit. Generally this works well but there are times when you might want to have more control over the amount of boost or cut at certain volumes…the loudness defeat switch is a bonus which gives a bit more flexibility. In this class of equipment you would generally leave it on for the fullest sound. The RF-1401 is a nice radio with very good overall reception and great audio (stronger audio in fact than the Superadios). Its AM is close to but not quite the equal of the Superadios but I upgraded mine with a longer ferrite rod and it is now fully competitive with a GE SRI or SR II for AM reception capability with some pros and cons which I will explain. 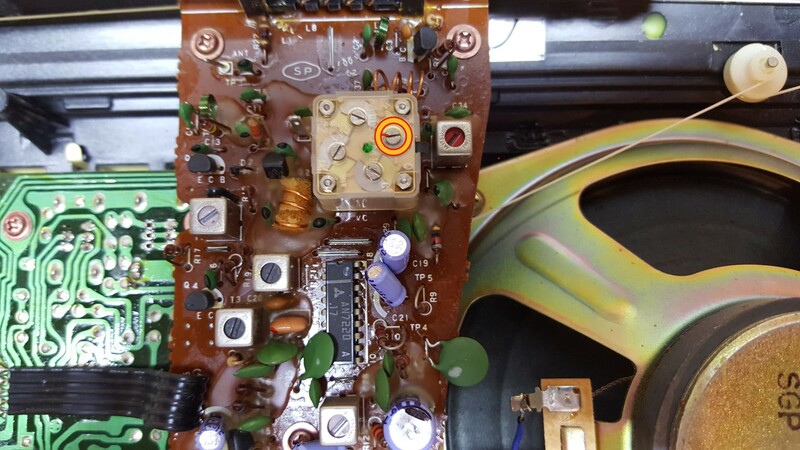 (See more about upgrading the RF-1401 to Superadio performance at the end of this review). Performance: The RF-1401 is a solid performer and is pleasing and simple to use. As I mentioned at the top its AM is not Five Stars in my AM Mega Shootout Article…it rates as ***1/2 which is still very good. I eventually replaced the original 6” ferrite rod AM antenna with an 8” rod and it boosted the radio up to ***** with one minor caveat – a two stage AM IF and ceramic vari-cap tuning capacitor contributed to a slight susceptibility to desensitization…a loss of sensitivity to weak signals when many stronger signals are present. 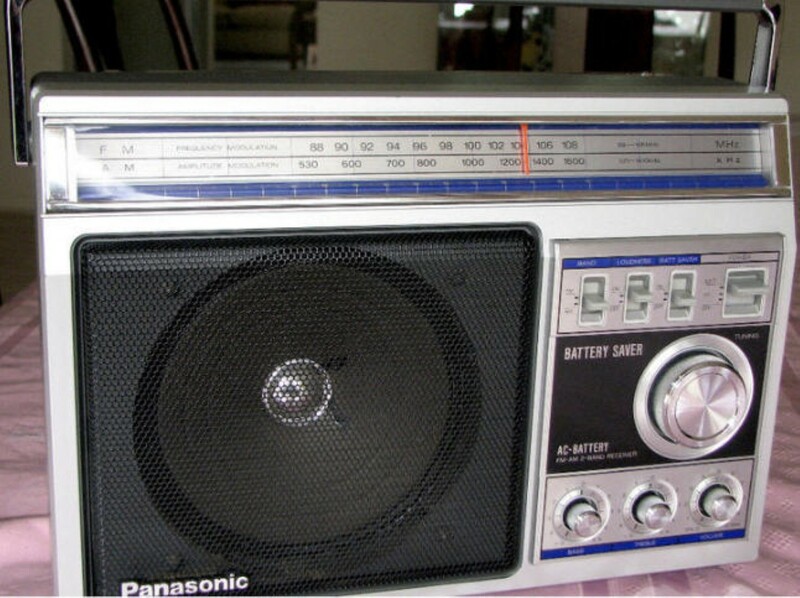 In addition, radios like the GE Superadios and Panasonic RF-2200 have three gang mechanical tuning capacitors with a tuned RF stage which are best at achieving high gain with high resistance to overload and desensitization, along with 4 and 5 stage IF’s rather than the Panasonic’s 2 stage IF. In many (perhaps most) situations these circuit compromises won’t make a noticeable difference but under certain signal conditions, such as the presence of some very strong AM signals they may. FM performance is comparable with similar radios of the era including the GE SR’s…it is quite sensitive but not as selective as today’s DSP-equipped portables. It is fine for routine reception and it sounds wonderful in general on both bands. Also of note the GE Superadios have AM and FM antenna terminals on the back panel for external antennas…the Panasonic does not. AGC & Loudness Compensation versus Audio Quality On Weaker Signals: When comparing the RF-1401 with two GE Superadios (I used both an original SR and an SR II) I found that the Panasonic had stronger AGC (Automatic Gain Control). Weaker signals were just as loud as the stronger ones. On the GE’s some weaker signals were a bit quieter which required that I increase the volume control setting to keep them at the same volume. At a certain point on the volume control the Loudness Compensation, which provides quite a bit of bass boost at low and medium volumes, begins to have less effect which made those signals sound thinner…less full, while they sounded very robust on the Panasonic…this was a definite point in the Panasonic’s favor. If you are at all technically adept this is an easy upgrade. Carefully slide the wire coil and its form off the end of the original ferrite rod. This involves some care to remove the adhesive until you can gradually loosen the coil without damaging it. Replace the stock 6” rod with an 8” rod which is available on-line or from a donor radio. Slide the coil onto the new rod. 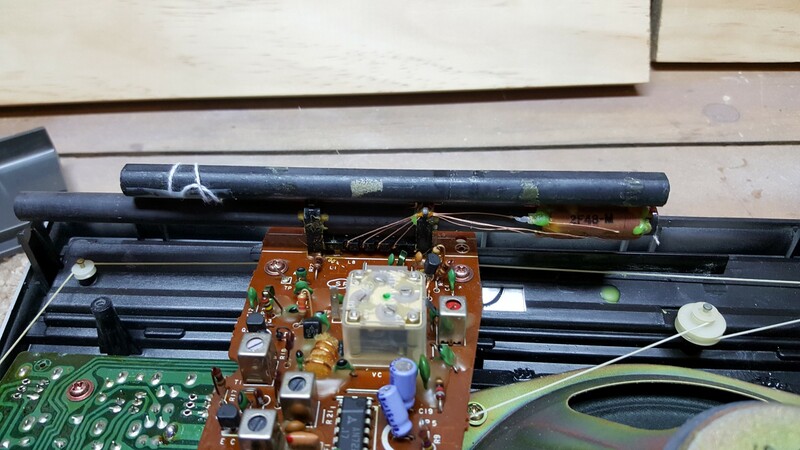 Ideally you would then re-align the radio but you can achieve a close approximation by tuning to a very weak station near 550 KHz and sliding the coil along the rod for loudest reception…it will usually be quite near the end of the rod. Lock the coil in place with a dab of cement. If you want to get alignment even closer without test equipment you can additionally tune to a very weak signal near 1500 KHz on the dial and adjust the AM Antenna trimmer circled below for loudest audio. Do not make any other adjustments unless you have the service manual and know exactly what you are doing! Does The Upgraded Panasonic RF-1401 Match a GE SR or SR II? Yes and No. Like so many things the answer is not simple. It’s actually better in some ways, and less good in another. Before the antenna modification the RF-1401 was just slightly less sensitive to weaker signals than the GR SR’s, but it still sounded a bit better on many stations due to its more robust audio and stronger AGC action. And its FM was at least as good, so with the slightly better audio I think most users would like the radio quite a bit. It rates as ***1/2 on my AM Mega Shootout Article. After the modification I again compared the RF-1401 with my GE Superadio I and II. The Panasonic was actually slightly more sensitive from the bottom of the AM band all the way up to about 1100 KHz. Several weak stations came in more loudly and clearly on the RF-1401, and the stronger overall audio made it sound more powerful. From about 1100 KHz to the top of the AM band they were very close overall. However the Panasonic suffered on a few stations due to desensitization …a loss of sensitivity to some weak signals in the general vicinity of some stronger local signals. It was also slightly less selective on this part of the dial as well. ..the reasons for both of these issues were explained earlier. However these effects were generally subtle and remember…the PAN actually beat the SR’s from 530 to 1100 KHz so overall I rate it as fully their equal, and with overall better audio to boot. Overall it now rates as ***** in the AM Mega Shootout list. 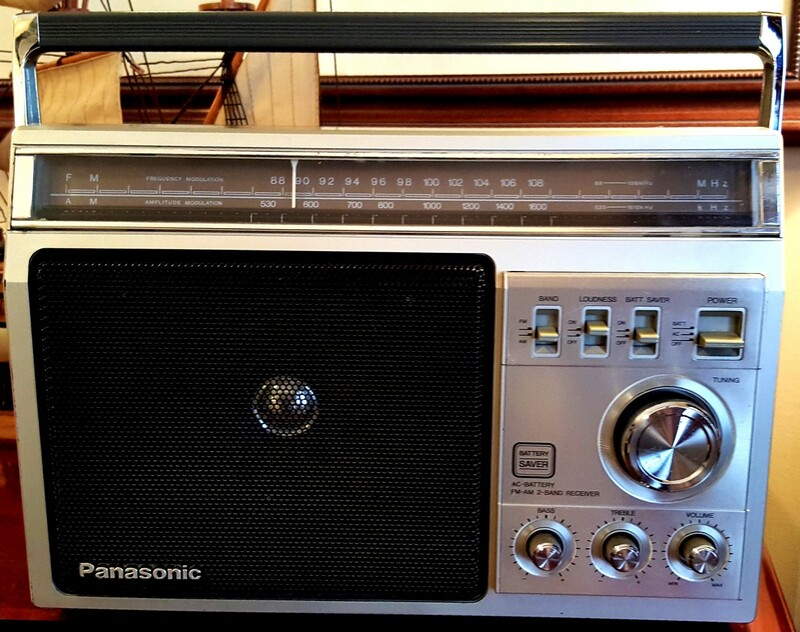 The Panasonic RF-1401 is a great radio as it came from the factory…upgrading it to an 8” ferrite rod AM antenna makes it even better. Recommended either way!